Raising a health-conscious little guy is always at the forefront of my parenting mind. I know that the habits we create with our child will carry him through to adulthood. At the same time, my husband and I want to be here and healthy to see him through adulthood - to us, this means moving our bodies, and fueling them with good things. 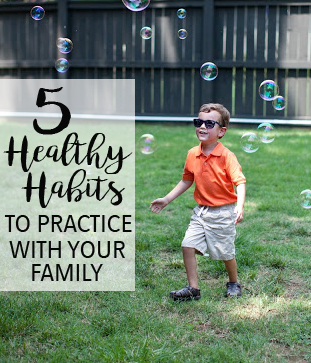 Here are my top five ways to practice healthy habits with your family (because everything is more fun when you're doing it with someone else, right?). 1. Under a mile? Walk or ride in style! Parker read this phrase in an Earth Day book, and while it's focused on making a planet-friendly habit, I love that it also promotes exercise. Weather pending, if something is within a couple miles of our house (coffee shops, parks, the library, farmers market, piano lessons), we're walking there! You could most definitely up the miles if you're biking. Don't live within walking distance to any destinations? Try parking far away to increase walk time or take the stairs instead of elevators. 2. Place a full water glass at each place setting for dinner. 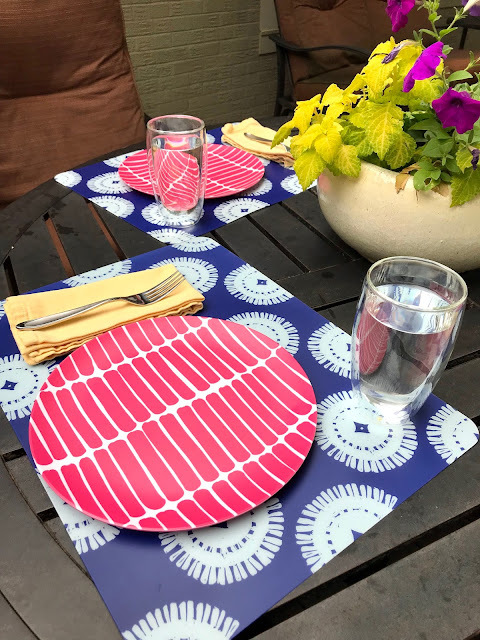 Your family might already do this, but when setting a table, automatically include a full glass of water at each setting, just as you would silverware or a napkin. You'll be less likely to grab another beverage that's not as healthy (soda, juice) and even if you do add another drink, you'll still be drinking more water just because it's there. Score. 3. Try new family fun activities. Tennis, bowling, golfing, backyard baseball, swimming - these are all activities that can involve the whole family. Sample new sports and practice your favorites, and your bodies will thank you! 4. Grow your own food! Watching a garden grow is nothing short of magical! 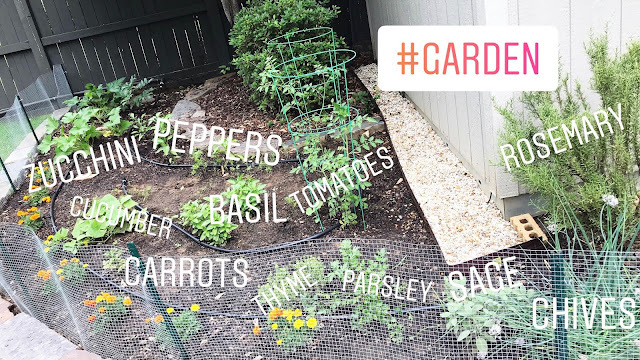 Grow your own fruits, veggies and herbs to get the whole family involved in preparing a garden to table meal. This is a great way to incorporate more fruits and veggies on everyone's plate, and as a bonus, it gets everyone outside and moving! If you're limited on outdoor space, use pots instead and grow anything from herbs to cherry tomatoes! 5. Provide Natrol Multi Gummies to your family. 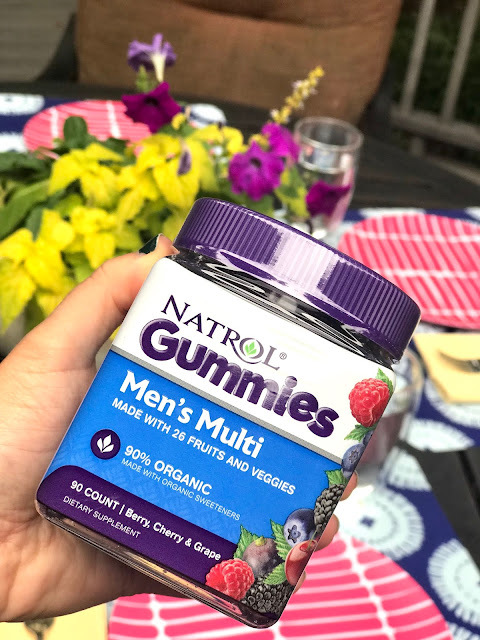 And because even the best of diets can still use more vitamins and minerals, introduce Natrol Multi Gummies to your family! These gummies are non-GMO, made with organic ingredients, and are gelatin-free and vegetarian. Most important to me, they are free of artificial flavors, sweeteners, colors, and preservatives, so I feel good about giving them to my whole family. As a bonus, everyone loves a gummy, am I right? So they are actually fun to take and taste great. 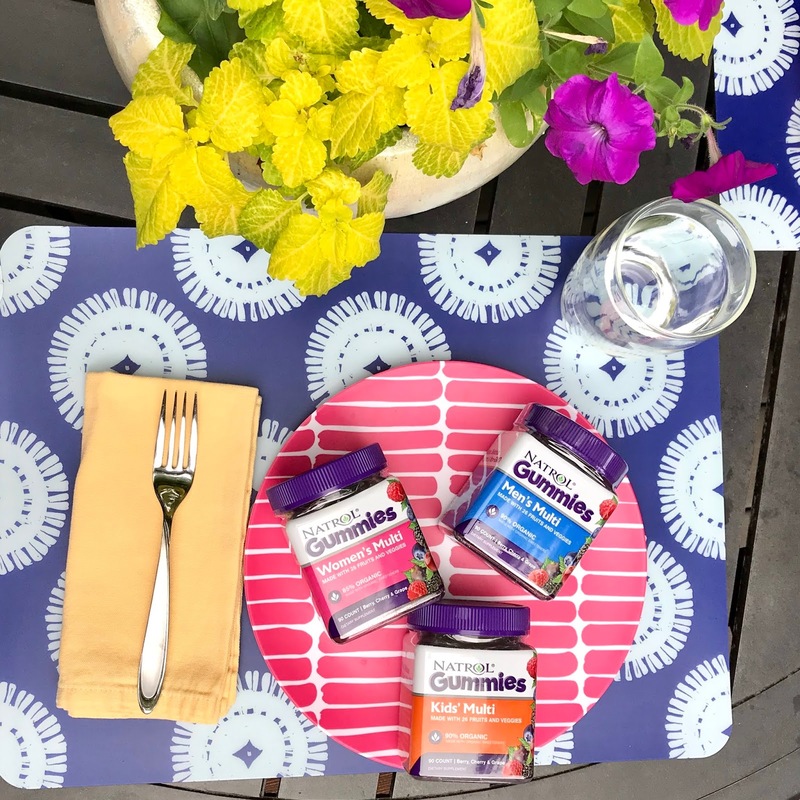 They are a healthy addition to your daily routine - bring them out when setting the table for dinner to make it even easier for everyone to take them! To find your own Natrol Multi Gummies, just look for the purple lid wherever you see supplements. CLICK HERE to learn more about Natrol Gummies! These statements have not been evaluated by the Food and Drug Administration. The product is not intended to diagnose, treat, cure or prevent any diseases. Our kids LOVE gummy vitamins so we will have to find these! I love that they're organic and have none of that artificial junk in them like some of the others do! Yes to these. Especially the full water glass by each table setting. I love Natrol vitamins. I need these ones now!